A friend who knows I love this kind of stuff gave me four old issues of Superman's Girl Friend Lois Lane, a DC Comics title published between 1958 and 1974. These relics of a time gone by are hilariously terrible! I'd always thought of Lois as the practical, hard-nosed reporter, but I guess that was all Margot Kidder's doing. 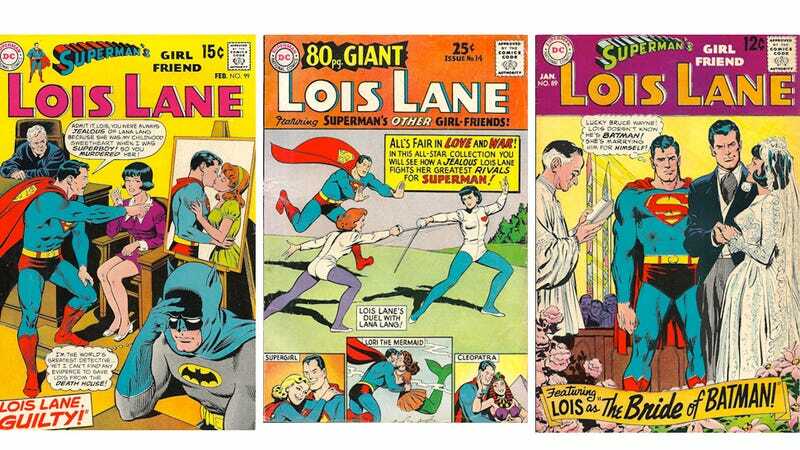 In these comics, without fail, Lois is a posessive, jealous, needy, self-centered harpie who repeatedly attempts to persuade, bully or trick Superman into marrying her. By the 1970s, the stories began to reflect growing social awareness: Lois became less fixated on romance, and more on current issues. In the controversial story "I Am Curious (Black)!" in #106 (Nov. 1970), for example, Lois uses a machine that allows her to experience racism firsthand as an African American woman.